GRIFFIN Illusion Cord is perfectly suited for the creation of necklaces which incorporate seemingly „floating“ pieces of jewelry. It is therefore a suitable addition to use in combination with glass beads and transparent stones such as rock crystal. This crystal-clear nylon thread is especially tear-proof and subtle and has been particularly developed for the production of jewelry. 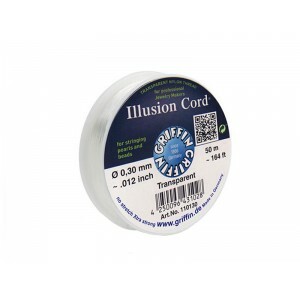 GRIFFIN Bead Cord/Wire Ends are the ideal supplies to finish off pieces of jewelry made with GRIFFIN Illusion Cord.